JamesJoyceLibrary is a Legacy Library. Legacy libraries are the personal libraries of famous readers, entered by LibraryThing members from the Legacy Libraries group. JamesJoyceLibrary is also an author. » See James Joyce's author page. 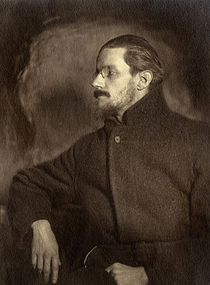 About meJames Augustine Aloysius Joyce (2 February 1882 – 13 January 1941) was an Irish poet, playwright and novelist. With his experimental style of writing and monumental novel Ulysses, Joyce became a leading figure in the modernist movement of the 20th century. Growing up in a wealthy, middle-class household, Joyce had access to his father's small collection of books. Though there's no great evidence to suggest that John Joyce was a great reader and collector of literature, this was to be his first initiation to the written word, with titles on mythology and early Irish literature. Joyce had a Jesuit upbringing, sent to boarding school at Clongowes Wood College in Kildare, followed by Belvedere College in Dublin. As highlighted in A Portrait of the Artist as a Young Man, Joyce's reading branched out into English literature and more classical works. The schools' syllabi introduced him to authors such as Ovid, and the modern writings of Cardinal Newman, a writer Joyce would admire. He also frequented the Dublin City Public Libraries where the selection of literature was not entirely administered by the Catholic Church. Works by Thomas Hardy and Tolstoy were within his reach. Joyce furthered his studies at University College Dublin on St. Stephen's Green, choosing a course in modern languages. Money to purchase books with was scarce in the Joyce household. Though he regularly haunted the doorsteps of Dublin's secondhand book sellers and the stalls along the quays, Joyce was a regular to the National Library of Ireland. There he rarely studied books relevant to his university education, but pursued his own interests instead. In his first year he became immersed in the works of Carlyle, Macaulay, Dante, Materlinck, Turgenev, Zola, Blake, D'Annunzio and a writer closer to home, Yeats. He also developed a lifelong passion for the writing of Norwegian playwright, Henrik Ibsen. After a chance encounter and falling in love with Nora Barnacle, Joyce left Ireland in 1904 for a teaching position with the Berlitz Language School in Pola, and later Trieste. Weighed down with poverty, he only brought a small selection of his books with him. These included titles which he was using to work on his new novel. Once Joyce and Nora settled in to their new life, his brother Stanislaus joined them, allowing the family's finances to be spent on literary volumes. Purchasing books to read rather than collect, the library that formed became a significant part of Joyce's life, influencing his writing and his personal relationships. Once World War I broke out in Europe, Joyce, Nora and their two children, Giorgio and Lucia fled Italy to Zurich. The trip across the border was considered dangerous and Joyce was unable to bring many of his books with him. He was close to finishing Ulysses so once the family settled in the Swiss city, he began to purchase duplicate titles with what little money he had, and borrowed works from friends and acquaintances. His biographer Richard Ellmann was later able to list many of the volumes Joyce acquired while in Zurich, identifiable from his letters and correspondences and from the multiple copies. After the war ended, the family returned to Trieste, but within two weeks of receiving an invitation from the American poet Ezra Pound, Joyce moved his family to Paris. The library he and Stanislaus acquired together remained in Italy. Once settled, Joyce sent word to his brother, asking that the books be shipped to France, but for reasons unknown, the collection was never sent and went unaccounted for until the 1950's when its importance was rediscovered. The books which formed Joyce's Trieste and Zurich libraries are now held by the Harry Ransom Center at the University of Texas. Joyce considered Paris home for the next two decades. The family moved around quite a lot in Paris, never quite happy with an apartment for long. Sometimes living out of hotels, Joyce's personal belongings were often placed in storage, including his book collection. Once Ulysses was published by Sylvia Beach, his personal library began to grow considerably. He enjoyed the literary success and with it, receiving presentation copies of other authors' works. However, with his failing eyesight, the volume of books Joyce was gifted with meant that not all works were read. This can be surmised by the level of uncut pages recorded in Thomas Connolly's The Personal Library of James Joyce: a descriptive bibliography. In 1939, Joyce and his family were forced to downsize from their spacious apartment at rue Edmond-Valentin to a much smaller flat. An inevitable result was that his Parisian library was downsized also. It is estimated that in the several months up to the move, Joyce was forced to reduce his collection by over 2,000 titles, which were distributed amongst his close friends and local hospital. The remaining books were stored until Joyce's death two years later, at which time they were sold by his landlord in respect of rent owed. Paul Leon, a close friend of Joyce, managed to save a selection of manuscripts and personal papers and was able to buy back almost 70 percent of the books sold. The papers were gifted to the National Library of Ireland while the books which formed his Paris library are now held at the Lockwood Memorial Library at the University of Buffalo. Sources: The books which Joyce read throughout his life impacted greatly on his own writing, from the works he read whilst attending school in Dublin, to the books he purchased in Zurich in the midst of World War I. Unlike the libraries of most great writers, Joyce's books which he owned throughout his life were never established in a single place for a considerable length of time. There have been several successful acquisitions by institutions to piece together Joyce's personal library from Trieste, Zurich and Paris. This bulk of this library was only possible through the dedicated work of the archivists of both the Harry Ransom Center and the Lockwood Memorial Library for recognising the importance of such a collection, and preserving it. The books which Joyce possessed and read throughout his time spent in Dublin was referenced from the work of several Joycean scholars, and pieced together from library catalogues and exhibition bibliographies. A full list of these sources can be found on the legacy profile. Marginalia: Throughout his library, Joyce had a unique way of marking the passages in his books which he wished to refer to at a later date. He used a system of pencilled dots in the book's margin to indicate an interesting sentence, paragraph or illustration. In several works the dots were even placed at chapter headings. The level of interest was recorded in the quantity and texture as some dots were lighter whilst others were heavily pencilled in and positioned on top of one another. These could be considered an indication of Joyce's excitement in what he was reading. Once the book was closed, Joyce also pencilled another dot on the fore edge so the page required would be easily accessible. Further details and examples can be found in Thomas Kenny's "James Joyce's System of Marginal Markings in the Books of his Personal Library." Journal of Modern Literature 6.2 (Apr., 1977): 264-276.